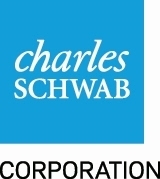 SAN FRANCISCO--(BUSINESS WIRE)--The Charles Schwab Corporation announced today that its net income for the fourth quarter of 2017 was $597 million, up 14% from $522 million for the fourth quarter of 2016. Net income for the twelve months ended December 31, 2017 was nearly $2.4 billion, up 25% year-over-year. The company’s financial results for the fourth quarter and full-year 2017 were impacted by the tax reform legislation signed in December − a one-time tax expense of approximately $46 million decreased earnings per share by $0.03. (1) Effective January 1, 2017, a new accounting standard prospectively changed the treatment of a portion of the tax deductions relating to equity compensation. These deductions were previously reflected in additional paid-in capital, a component of stockholders’ equity, and are now included in taxes on income, a component of net income. The company’s tax expense for the fourth quarter and full year 2017 decreased by approximately $40 million and $87 million, respectively, as a result of this change. Future effects will depend on the company’s share price, restricted stock vesting, and the volume of equity incentive options exercised. (2) Reflects net litigation proceeds of $16 million in 2016, relating to the company’s non-agency residential mortgage-backed securities (RMBS) portfolio, which are included in Other revenue. New retail brokerage accounts for the quarter totaled approximately 248,000, up 36% year-over-year; total accounts were 7.4 million, up 4% year-over-year. Opened one independent branch in Germantown, WI, to bring the total to 40, continuing the company’s franchising initiative designed to make financial advice more accessible. Hosted 4,900 advisors, exhibitors, sponsors, and media at our IMPACT® conference – the largest and longest-running annual gathering of independent registered investment advisors. Expanded Schwab OpenView Gateway®, the open architecture platform that enables integration between Schwab systems and technology providers, by adding eMoney for financial planning and Addepar for portfolio management. Launched new StreetSmart Central™ and StreetSmart Mobile™ Trading Platforms, marking the full integration of optionsXpress® technology within Schwab. Balance sheet assets = $198.6 billion, up 13% year-over-year. Outstanding mortgage and home equity loans = $12.0 billion, up 4% year-over-year. Pledged Asset Line® balances = $4.4 billion, up 13% year-over-year. Schwab Bank High Yield Investor Checking® accounts = 1.0 million, with $13.4 billion in balances. Client assets managed by Windhaven® totaled $8.1 billion, down 10% from the fourth quarter of 2016. Client assets managed by ThomasPartners® totaled $14.6 billion, up 43% from the fourth quarter of 2016. Client assets managed by one of the company’s digital advisory solutions (Schwab Intelligent Portfolios®, Institutional Intelligent Portfolios®, and Schwab Intelligent Advisory®) totaled $27.3 billion, up 122% from the fourth quarter of 2016. 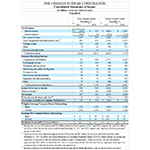 *Charles Schwab received the highest numerical score in the J.D. Power 2016 and 2017 Full Service Investor Satisfaction Studies, based on 6,006 responses from 20 firms measuring opinions of investors who used full-service investment institutions and were surveyed in January 2016 and 6,579 responses from 20 firms measuring opinions of investors who used full-service investment institutions and were surveyed in January 2017. Your experiences may vary. Visit jdpower.com. **Restrictions apply: The $4.95 commission does not apply to certain transactions. All broker-assisted and automated phone trades are subject to service charges. See the Charles Schwab Pricing Guide for Individual Investors for full fee and commission schedules. If you are not completely satisfied for any reason, at your request Charles Schwab & Co., Inc. will refund any eligible fee related to your concern within the time frames described below. Two kinds of “Fees” are eligible for this guarantee: (1) asset-based “Program Fees” for certain investment advisory services sponsored by Schwab; and (2) commissions and fees listed in the Charles Schwab Pricing Guide for Individual Investors (“Account Fees”). Program Fee refund requests must be received no later than the next calendar quarter after the Fee was charged. Account Fee refund requests must be received within one year of the date that the Fee was charged. Periodically, our Chief Financial Officer provides insight and commentary regarding Schwab’s financial picture at: http://www.aboutschwab.com/investor-relations/cfo-commentary . The most recent commentary, which discusses the impact of tax reform legislation, was posted on December 22, 2017. The company has scheduled a Business Update for institutional investors on Tuesday, February 6, 2018. The Update is scheduled to run from approximately 8:30 a.m. - 12:15 p.m. PT, 11:30 a.m. - 3:15 p.m. ET. Participants will include members of the company’s executive management. A simultaneous webcast of this Update will be accessible to the public at http://schwabevents.com/corporation . This press release contains forward-looking statements relating to the company’s business growth; crossing the $250 billion asset threshold; balance sheet growth; asset gathering; and bulk transfers. Achievement of these expectations and objectives is subject to risks and uncertainties that could cause actual results to differ materially from the expressed expectations. Important factors that may cause such differences include, but are not limited to, the company’s ability to attract and retain clients and registered investment advisors and grow those relationships and client assets; general market conditions, including the level of interest rates and equity valuations; competitive pressures on pricing, including deposit rates; the company’s ability to develop and launch new products, services and capabilities in a timely and successful manner; client use of the company’s investment advisory services and other products and services; the timing and amount of bulk transfers; the quality of the company’s balance sheet assets; client sensitivity to interest rates; regulatory guidance; and other factors set forth in the company’s most recent reports on Form 10-K and Form 10-Q. 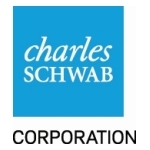 The Charles Schwab Corporation (NYSE: SCHW) is a leading provider of financial services, with more than 345 offices and 10.8 million active brokerage accounts, 1.6 million corporate retirement plan participants, 1.2 million banking accounts, and $3.36 trillion in client assets as of December 31, 2017. Through its operating subsidiaries, the company provides a full range of wealth management, securities brokerage, banking, money management, custody, and financial advisory services to individual investors and independent investment advisors. Its broker-dealer subsidiary, Charles Schwab & Co., Inc. (member SIPC, http://www.sipc.org ), and affiliates offer a complete range of investment services and products including an extensive selection of mutual funds; financial planning and investment advice; retirement plan and equity compensation plan services; referrals to independent fee-based investment advisors; and custodial, operational and trading support for independent, fee-based investment advisors through Schwab Advisor Services. Its banking subsidiary, Charles Schwab Bank (member FDIC and an Equal Housing Lender), provides banking and lending services and products. More information is available at www.schwab.com and www.aboutschwab.com . (1) Includes fee waivers of $0 million and $31 million during the fourth quarters of 2017 and 2016, respectively, and $10 million and $224 million during the twelve months ended December 31, 2017 and 2016, respectively, relating to Schwab-sponsored money market funds. (2) Taxes on income were reduced by approximately $40 million and $87 million for the three and twelve months ended December 31, 2017 to reflect the required adoption of Accounting Standards Update 2016-09, which changes the accounting treatment of a portion of the tax deductions relating to equity compensation. Taxes on income were also increased by approximately $46 million in December 2017 due to the enactment of the Tax Cuts and Jobs Act legislation resulting in the remeasurement of deferred tax assets and other tax adjustments. (3) Includes preferred stock dividends and undistributed earnings and dividends allocated to non-vested restricted stock units. (1) Return on average common stockholders’ equity is calculated using net income available to common stockholders divided by average common stockholders’ equity. (2) Advice solutions include managed portfolios, specialized strategies, and customized investment advice such as Schwab Private Client, Schwab Managed Portfolios, Managed Account Select®, Schwab Advisor Network®, Windhaven® Strategies, ThomasPartners® Strategies, Schwab Index Advantage® advised retirement plan balances, Schwab Intelligent Portfolios®, Institutional Intelligent Portfolios®, and Schwab Intelligent Advisory®, launched in March 2017; as well as legacy non-fee advice solutions including Schwab Advisor Source and certain retirement plan balances. Beginning in the fourth quarter of 2017, a prospective change was made to add non-fee based average assets from managed portfolios. Average client assets for advice solutions may also include the asset balances contained in the mutual fund and/or ETF categories listed above. For a total end of period view, please see the Monthly Activity Report. (3) Includes various asset-related fees, such as trust fees, 401(k) recordkeeping fees, and mutual fund clearing fees and other service fees. Beginning in the first quarter of 2017, a prospective methodology change was made to average client assets relating to 401(k) recordkeeping fees to provide improved insight into the associated fee driver, which resulted in an increase of approximately $25 billion. There was no impact to revenue or the average fee. (1) Includes proprietary equity and bond funds and ETFs held on and off the Schwab platform. As of December 31, 2017, off-platform equity and bond funds and ETFs were $10.1 billion and $24.0 billion, respectively. (2) Excludes all proprietary mutual funds and ETFs. (3) Fourth quarter of 2017 includes an inflow of $16.2 billion from a mutual fund clearing services client. Second quarter of 2017 includes inflows of $18.3 billion from a mutual fund clearing services client. First quarter of 2017 includes an outflow of $9.0 billion from a mutual fund clearing services client. (1) October 2017 includes an inflow of $16.2 billion from a mutual fund clearing services client. June 2017 includes an inflow of $15.6 billion from a mutual fund clearing services client. February 2017 includes an outflow of $9.0 billion from a mutual fund clearing services client. 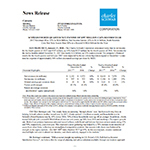 (4) Schwab One®, certain cash equivalents, bank deposits, and money market fund balances as a percentage of total client assets. (7) Represents average total interest-earning assets on the Company’s balance sheet.